Russian Folk Costume | Visit Russia in Arizona! After Peter’s decrees, both Russian nobility and the costumes in the cities underwent Europeanization. This changed the aesthetic notions of beauty among the upper-class citizens. The Russian peasantry, on the other hand, remained custodians of the traditional national ideals and styles. The shapes, types of cutting, beautiful decorations and colors, and hats of Ancient Russia existed among the peasants until the 18’th – 19’th centuries. In the second half of the 19’th century – beginning of the 20’th century, peasant clothing began to feel the influence of industrialization, first expressed in the use of factory fabrics, trimmings, hats, shoes, eventually changing the very forms of clothing. The general character of Russian folk costume was formed over many generations, corresponding to the appearance, lifestyle, and nature of work of the people. 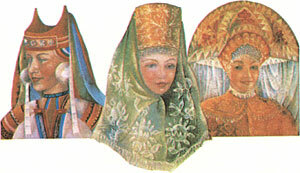 Terms of historical development since the XII – XIII century identified the most typical forms of separation of Russian costume on the north and south. In the XIII – XV centuries, Northern regions (Vologda , Arkhangelsk, Great Ustyug, Novgorod, Vladimir etc. ), unlike the South, were devastated by the raids of the nomads. In the North, crafts would start develop intensively, and foreign trade flourished. Since XVIII century, North turned away from the developing industrial centers and, therefore, has preserved the integrity of the national life and culture. 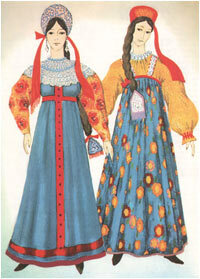 That is why the Russian national dress of the North features have deep reflection of foreign influences. Southern Russian costume (Ryazan, Tula, Tambov, Voronezh, Penza, Orel, Kursk , Kaluga etc.) much more diverse in forms of clothing. Repeated relocation for nomadic incursions , and then during the formation of the Muscovite state, the influence of neighboring peoples (Ukrainians, Belarusians, peoples of the Volga) have contributed to more frequent changes of forms and diversity of kinds. 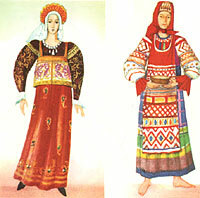 In the most general features, form sections of northern and southern Russian costumes, certain features characterize suit each province, district and even village. People’s clothes were different on purpose (humdrum, holiday, wedding, and funeral), age, and marital status. The most common signs the differences were not cut and type of clothing, and its color, the number of decor (embroidered and woven patterns), the use of silk, gold and silver threads. The most elegant clothing was made of red cloth. The concepts of “red” and “beautiful” were in the national presentation is unique. The fabric used for traditional peasant clothes were homespun linen and wool simple plain weave, and from the middle XIX century, factory-made silk, satin, brocade with patterns of lush flower garlands and bouquets, red calico, chintz, satin, cashmere color. The main methods of ornamentation household fabrics were patterned weaving, embroidery, printing of. Striped and plaid patterns are diverse in form and color. Technology folk patterned weaving and embroidery threads in a row resulted in straight, geometric outlines, the lack of rounded shapes in the pattern. The most common elements of ornamentation: diamonds, diagonal crosses, octagonal stars, rosettes, Christmas trees, bushes, stylized figures of women, birds, horses, deer ( Fig. 1 ). 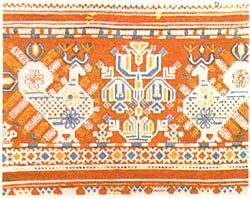 Patterns, woven and embroidered, were carried out, linen, hemp, silk and wool threads, colored with vegetable dyes, giving the muted shades. Gamma colorful colors: white, red, blue, black, brown, yellow, green. Multicolor solved, often based on white, red and blue (or black) colors. Since mid XIX century, homespun fabric factory replaced with printed floral, plaid, striped patterns. Folk costumes with red roses and bright green leaves on a black or red background, we find in the paintings Malyavin, Arkhipova, Kustodiev, reflecting the bright national originality of Russian folk life this time. Distinguish the elements, the Russian national costumes northern and southern areas contain common basic features, and in costume more common in women – differences. Man’s costume consisted of shirts with low reception or no , and rather narrow pants of canvas or krasheniny. Shirt made of white or colored linen worn over trousers and girdled with a belt or a long woolen sash. Decorative decision shirts – embroidery on the bottom of the product, the bottom of the sleeves, neck (Fig. 2, left). Embroidery is often combined with inserts of fabric of another color, the location of which emphasized the design shirt (matching the front and back seams, gusset, edging the neck, the line connecting sleeves with armholes). Outerwear served as a coat or jacket of homespun cloth, plowed on the left side, with Velcro hooks or buttons (Fig. 2, right), winter – sheepskin coat. Men’s footwear – boots or sandals with onoochas and equip. Women’s costume in the Northern and Southern regions distinguish individual parts, the location of finishing. But the main difference was the predominance in the northern suit sundress, in the south – their skirts. The basic parts of a female national dress was a shirt, apron, or curtain, sundress, skirts, bib, shush pan. Women’s shirt, as well as men, were straight cut, with long sleeves. White canvas shirt decorated with red patterned embroidery located in the chest, Mantle, at the bottom of the sleeves and on the bottom of the product. The most complex, multi-figured compositions with a large picture (fantastic female figures, fabulous birds, trees), which reached a width of 30 cm, located on the bottom of the product. For each part of the shirt was a traditional ornamental decision. In the southern areas of direct cut of the shirts was more complex, it was carried out using the so -called Polycom – parts of a cut, connecting the shelf and back through the shoulder. Pawlick could be direct and oblique. Pawlick rectangular piece of cloth joined four canvas width 32-42 cm each (Fig. 3). Skew Paulik (in the form of a trapezoid) combined with a broad base sleeve, narrow – with a shell neck (Fig. 4). Both emphasized the decorative design solutions. Compared with the bottom line North Russian shirts in southern ornamented more modestly. The most decorative and ornate part of both the northern and southern women’s costume was an apron or a curtain, closing the female figure in front. Apron usually made of canvas and ornamented with embroidery, woven pattern, color decorative accents, patterned silk ribbons. District apron decorations for teeth, white or colored lace, fringe of silk or woolen threads, frill widths (Fig. 5). The white linen shirts and aprons for the northern peasant woman wore a jumper. In XVIII century and in the first half XIX century, sundresses made from solid, plain fabrics: blue linen, calico, red colored, black homespun wool. Multiple patterned and colorful embroidered shirts and aprons are won on a dark smooth background sundress. Kosoklinny cut sundress had several options. The most common was a sundress with a seam in the middle of trans, trimmed with patterned ribbons, tinsel lace and vertical row of copper and pewter buttons. This sundress has a silhouette of a truncated cone with a large downward extension (up to 6 m), giving the figure of a slender figure. At Fig. 6 The left shows the girl’s costume Moscow Province mid XIX century. It consists of colored shirts with wide sleeves and narrowed down kosoklinnogo sundress decorated with colored stripe and pewter buttons. Pearl embroidered headdress, kokoshnik, and necklace. At Fig . 6, the right – straight pleated sundress of later period. It is made of four – eight straight legged tissue collected at the top of minor folds, steached on 5.3 cm from the edge of the front and 10-20 cm behind. Direct sun dresses were made of printed fabrics: pestryad, calico, satin, cashmere, brocade with floral pattern. Shirt for him and made of bright colored fabric. 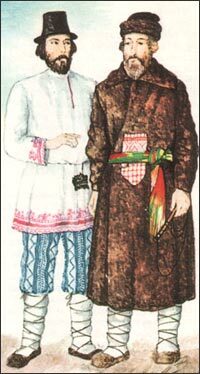 The clothing of the Russian North from the ancient costume saved “epanechki” and sleeveless jackets, quilted on cotton, with sleeves. At Fig . 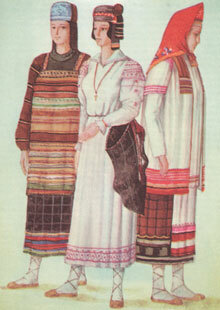 7, left – the costume of a peasant Tver Province: sundress , “epanechka”, brocade blouse and smart Kokoshnik. In Southern Russian costume instead sundress more widely used skirts – waist clothing from wool fabric, sometimes on canvas lining. The fabric used for skirts – most dark blue black, red, with a checked or striped (with the transverse location of the bands) pattern. Everyday skirts off with modest: woolen homespun patterned braid (belt) on the bottom. Holiday skirts are richly decorated with embroidery, patterned ribbon, inserts of calico, krasheniny, tawdry lace, sequins. Wide horizontal stripe skirt combined with proshvami, vertical color inserts. The choice of colors skirts were particularly bright and colorful because of their dark background. At Fig. 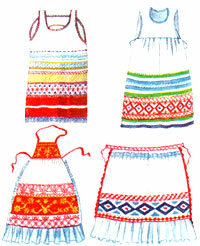 7, right – the costume of a peasant Orel: homespun linen shirts with embroidered entirely with patterned sleeves, ornate apron – curtain; Blue plaid skirts with colorful stripes and patterned lace at the hem; headdress – “forty” with a handkerchief top. The design of their skirts a three – five cloths fabric sewn along the edge. But wide bent for by the cost of lace (gashnika), consolidated at the waist. Skirts could be deaf and swing. Swinging skirts are sometimes worn with “podtykom hem” (Fig. 8, left) . In this case, skirts ornamented inside. In skirts female figure lost the stately elegance of attached to it sarafan. Waistline, revealed skirts, usually masked by an overlap shirt or apron. Often, over shirts, skirts, and wore a bib apron – bill or swing clothing from wool or linen (straight silhouette). Bib trimmed woven or braided braid on neck, side, bottom of the product and the bottom of the sleeves (Fig. 8, right). Stratification is a costume, had different lengths simultaneously worn shirts, skirts, apron, breastplates create horizontal segmentation of the silhouette, visually broaden the figure. In Russian folk dress saved the old hats and himself a custom for married women to conceal hair for girls – to leave uncovered. This custom is due to a form of women’s headgear in the form of a closed cap, a girl – as a wrap or bandage. Widespread kokoshniki (Fig. 9 , left ) Notts ( Fig. 9, right), a variety of bandages and crowns. From the jewelry used pearl, beads, amber, coral necklaces, pendants, necklaces, earrings. Ladies shoes were leather shoes, cats, edged at the top of a red cloth or leather, and sandals with onoochas and equip. At the end XIX century, in traditional clothing, along with factory- approved tissue gradually and forms of urban clothes, more uniform and standardized. This is a skirt and blouse, directly or adjacent silhouette with the Basques, shoulder scarves. This clothing was very bright in color. It was made of satin, satin, iridescent taffeta, rich orange, heather, emerald -green, crimson. Trimmed with white machine lace, ruffles, and buttons. The most colorful were headscarf, blouse and a more subdued color – skirt. Widespread in peasant clothes end XIX century, receives embroidery on printed drawings, specially prepared for the countryside: lush bouquets of garden flowers, wreaths and garlands of large roses.